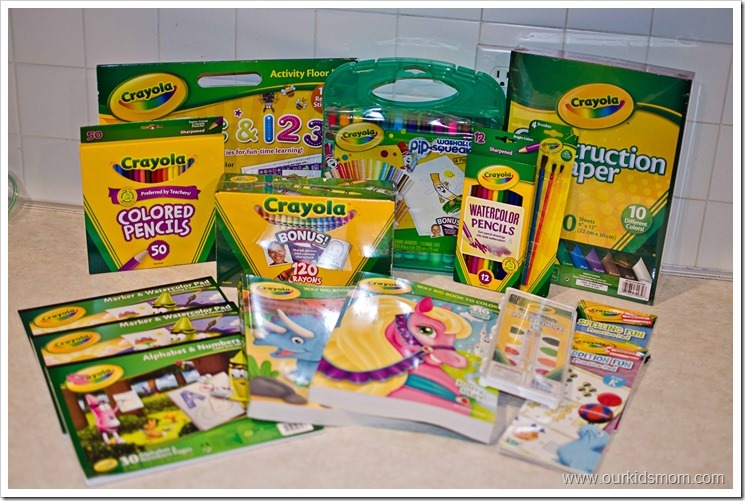 The Crayola product, information, and additional gift pack have been provided by Crayola. 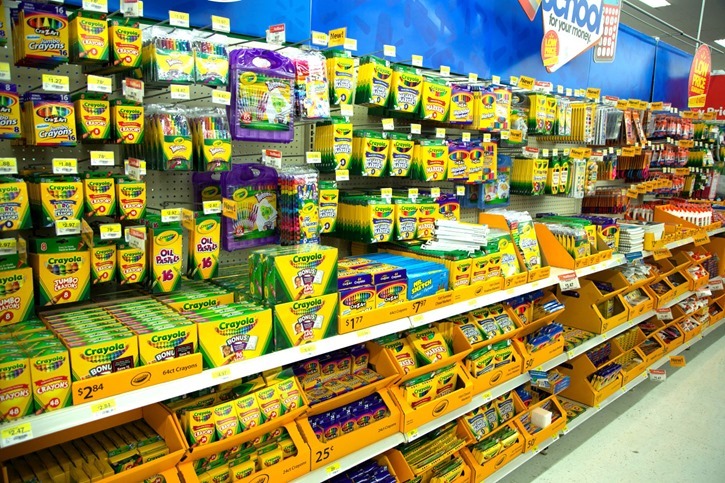 Back to School, for us, always means new school supplies. You know, the typical ones: pencils, erasers, notebook paper etc. Our school supply list has always (in my 16 years of BTS shopping) included Crayola crayons, markers and colored pencils. The teachers specifically ask for these because they know they are the best quality, will perform uniformly, are generally washable (those are always labeled “washable”) and will last the longest. I know they last because my children have been consistently bringing them back at the end of the school year and adding them to our container of old crayons to use during creative time at home. When Crayola asked if I would go shopping on their dime and show off my Crayola haul I was ecstatic. Yes, the children have been bringing home their used Crayola products at the end of the school year, but there is just something about using fresh/new art supplies that get the creative juices flowing. Because Ethan is still home during the day with me I decided to shop for arts and crafts items that he and I could do together. I, of course, picked up a few duplicates for Emma… but Ethan was my main thought when shopping this time. I initially was going to buy him the .50 box of crayons that I also purchased for Emma to take to school but decided on the larger box when I saw what a great deal it was. This will allow for more creativity (I hope). I was also going to purchase the same $1.99 washable markers that Emma got but noticed the fabulous deal on the washable pip squeaks markers (they are about half the size of “normal” markers) that came in it’s own carrying case. There were more colors to be creative with and they store neatly (and together) when not in use. Bonus! I went for variety again and grabbed the 50 count box of colored pencils. I purchased the typical watercolor paints as well as a box of watercolor colored pencils & a package of paint brushes. The children color normally with the colored pencils and then “paint” water over them to create a watercolor look. I purchased a marker & watercolor pad for each child as well as a coloring activity book for each. Ethan is still struggling with the alphabet and numbers so I picked up an Alphabet & Numbers pad as well as a floor activity pad. Construction paper is a must for cut and pasting. Just this week they made several colorful fans to cool themselves off with outside. Everything pictured above came in at just around $50. That is an amazing steal for the fun, learning and creativity that is going to flow from these items. I already have a stack of artwork from my Emma started on the clip on the fridge. 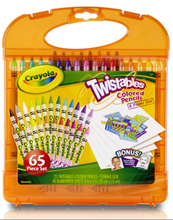 This “twisted” colorful collection of Crayola Twistables Colored Pencils and paper includes 65 pieces in a durable, portable carryall case. A smaller 5”x7” size is perfect for taking notes, keeping a personal diary or writing colorful ideas. 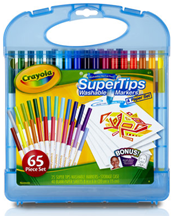 ONE OurKidsMom reader is going to win a $25 VISA GC to buy their own Crayola art supplies! This giveaway ended at 11:59 PM EST on September 6, 2013. 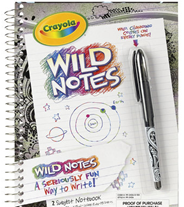 I love that they have so much associated with the wild notes line, can’t wait to get some for my daughter , she will love it! ! I love the Melt ‘N Mold Factory! I love the Dry-Erase Light Up Board! I used them as a kid and now so does my daughter. I like the dry erase light up board. I think the Marker Maker is pretty neat. It’s something to be really creative with! I love their Doodle Magic products! My niece would love the 96-count CRAYOLA Colors Box. I like the new Dry-Erase Marker Board Set! The dry erase board would be perfect for my grandson! being home schoolers I love that they have a craft section. I like the Dry-Erase Light Up Board. i love that they have erasable colored pencils now! I like the Crayola Color Wonder pads. 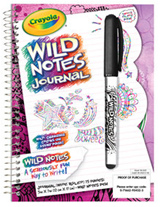 I must try the wild notes journal for my daughter- it is wonderful!! The Rainbow Rake looks like a lot of fun! I love the photo mix and mash!!! I like the Dry Erase Activity Workbooks! My grandson would love the Create2Destroy products. I didn’t even know about these. Lots of new cool products. I love the washable crayons! I like the Crystal Effects Window Markers, thanks! Dry-Erase board set looks cool! Crayola makes triangle crayons, now maybe my babe can color!! I like the Mini Twistable Special Effects Crayons!